Thanksgiving is the most “Ignatian” of all holidays. On this day, more than any other, we are inspired to acknowledge that all we have and all we are is gift from God. If we do this well, we will surely find ourselves in right relationship with God: knowing God as the great lover, and knowing ourselves as his beloved. Everything we do, every choice we make, will follow from this. St. Ignatius, founder of the Society of Jesus and author of the Spiritual Exercises, said that the experience of being loved by God for no reason other than that we exist is the foundation for our relationship with God. Accordingly, Ignatius insisted that, if we desire a closer relationship with God, we should begin by reflecting on how we are always at the center of God’s loving attention. As he put it, we should consider how God is looking at us at this and every moment, so that we might know in an experiential way the God who has made us, who sustains us, and who is ever drawing us into communion. Ignatius knew that this experience of being loved by God would result in our gratitude, that this gratitude would lead to our being freed from inordinate attachment to what is not God, and that, in freedom, we could now give ourselves without limit to God in return. Indeed, this is the essential dynamic of the Spiritual Exercises: experiencing God’s love, feeling gratitude, and being freed to love God in return. As you gather with family and friends around the dinner table this Thanksgiving and pause to say a “grace” before the meal, I encourage each of you to share aloud something specific, great or small, that God has given to you or to your loved ones. Consider all these gifts in silence for a moment, and notice God loving you through them. Let gratitude to God well up in your hearts, and then express together your gratitude to God. At our own Thanksgiving dinner – as we do each night before dinner – Fr. Rudy, Fr. 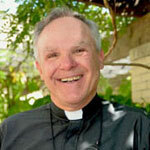 Pat, the other Jesuits at STM, and I will name you as one of God’s gifts to us, and we will thank God for you. And grateful to God, we will place ourselves more completely at your service.